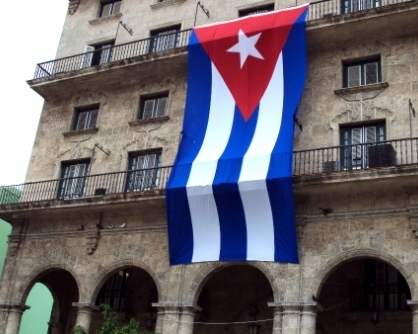 The Cuban flag is flown proudly everywhere you go in Cuba. It was created by Narciso Lopez in 1849, and put together by Emilia Teurbe Tolón. The origins date from 1849 when various movements to liberate Cuba from Spanish rule emerged, especially among Cuban exiles who lived in the United States. The design has three blue stripes, representing the three parts that the country was divided into during the independence wars; central, occidental, and oriental areas of the country. Two white stripes symbolize the purity of the patriotic cause. The red triangle (of masonic significance) stands for the blood shed to free the nation, which is placed where the star is, symbolizing the sky turned red from the blood shed in battle. The white star in the triangle stands for independence. This was because the United States seized Cuba from Spain during the Spanish-American War. It was a symbol of independence and sovereignty. 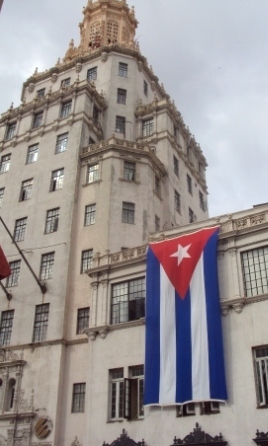 It has been used ever since, remaining unchanged after the Cuban Revolution of 1959.